In this spring’s LCC quarterly production, I produced, directed, and performed in a puppet sketch called “Accent Elimination for Animals.” Here is a picture taken by Lydia. From left to right: Scott and I on Professor Bottle Monster, Aki on Bobby the lamb/sheep, and Peter on Moostifer. And then we have two more furry puppets next to each other. This picture is taken by Kimmie. 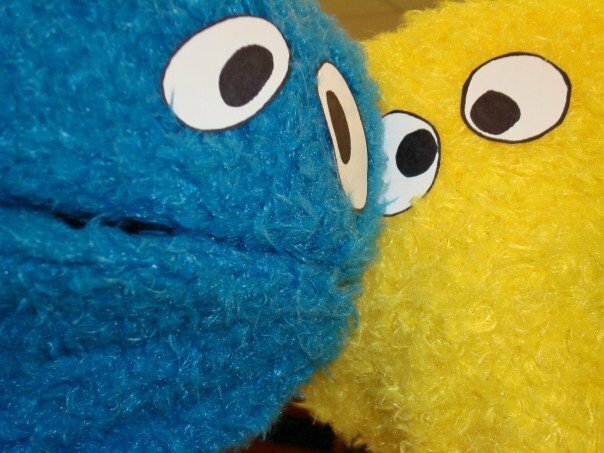 I believe that was my hand in the blue one and Clara’s in the yellow one. I don’t remember now. It’s not important anyway. Soon I’ll put up more videos and pictures of them. I’ll also have tutorials on how to make your own!